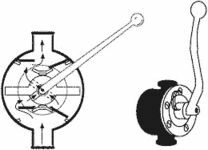 When the handle of the wobble pump is operated, the negative pressure created on one side pulls upwards lifts the lower flapper, allowing the fuel to flow behind it. As the handle is moved in the opposite direction, the lower flapper closes, preventing the fuel from escaping back into the line and causing it to flow through the passage shown by the arrows. The fuel is then forced through the upper flapper on the opposite side by the upward movement of opposite end of the wobble blade, thence to the carburetor. The cycle is repeated each time the handle is moved in either direction. A hand-operated fluid pressure pump for moving fluids such as gasoline, hydraulic fluid, or oil by a back-and-forth movement of the pump handle. The most common use is in a reciprocating engine where the wobble pump is used to build up fuel pressure before starting. Also known as an emergency hand pump. The only real redundancy built into the Cardinal RG's landing gear system is its emergency hand pump. The report shows that as the pilot came to the final approach to land, the landing gear failed to operate and four further attempts were made to lower the gear using an emergency hand pump.